I would like to thank you Cathy, so very much for the amazing workshop last weekend!! I had a fabulous two days meeting new friends and sharing beautiful food at your gorgeous home and can see I will have to do extra work hours as I could become a serious clay junkie! The last experience I had with clay was not an uplifting one, I had tried wheel work and felt that I had failed dismally! So it was with trepidation that I came along – thank goodness! It was one of the best weekends I’ve ever had and learnt tremendous hand building skills that can be incorporated into my artwork as well as a new and exciting artform. You have a lovely way of making everyone feel good about their masterpiece, especially with your clever tweaking! I was astounded at the finished pieces – they all were truly stunning! I look forward to sharing another fantastic workshop with you very soon. You are a woman after my own heart and a tremendous inspiration!! The day I met Cathy Lawley was one of the best days of my year – her home is gorgeous, her art is exceptional and her attitude to life is inspiring. Cathy doesn’t dwell on her past but she has endured great sadness. What’s amazing is that she has risen above it, using it to drive her forward, rather than allowing it to bring her down. She had the courage to change her life. And it’s amazing what she’s done. Cathy has created a name for herself as an artist – it’s amazing how she can capture a light, bright moment of life in her mind and the recreate it from a ball of clay. Who doesn’t smile when they look at one of her chooks? But she’s done so much more – she has shown her children how to live and she’s surrounded herself with things that have meaning and as a result her life is full of meaning. Cathy is a wonderful example of what can be achieved when you have the courage to change your life. It gives us great pleasure to write this testimonial regarding Cathy Lawley and her craftsmanship. We have built a Beach House at Teewah Beach on Noosa North Shore. It needed a striking feature to complement the main living area. After much searching, we found overseas, something that we really liked. We brought back some photographs and showed them to Cathy. Even though they were made of different material, Cathy resoursed, designed and developed these remarkable features for us. The project was quite major due to the weight and size considerations, but Cathy was innovative and skillful enough to produce these features for our house. The construction and erection and fixation was a feat in itself. As we are involved in a major football club we have many visitors from all walks of life. They have universally been so impressed by these clay features, especially the novel shapes and the subtle colours. The features are a constant talking point. The people are astounded that these peices have been made by a local artist as they consider them to be world class. We would thoroughly endorse Cathy as a very talented and professional craftsman and would unreservedly recommended her workmanship. Sue and myself purchased one of Cathy’s “Hens on the ladder” and put them on display on our verandah. One evening we heard a cluttering noise and were amazed and rather delighted to find one of the neighbours chooks had decided to join them and roost for the night! We carefully placed him back over the fence. Out of a time of great sadness and tragedy, came Cathy Lawley exuding an aura of beauty, light and creativity. Having just lost my gorgeous 18-year-old son, I was searching high and low for a suitable urn to capture Tyson’s young, vibrant essence. On the night Tyson left this earth plane, he was wearing one of his beloved hats. This was to become the inspiration for his urn. I met with Cathy who was so lovely and sensitive to my emotions at the time. I managed to explain exactly what I wanted, down to the finer details of a must have ankh, to the lyrics of one of Tyson’s favourite songs. With nothing but a photo to go by Cathy was able to capture and create a most personal gift for me, for which I will always be sincerely grateful. Thanks Cathy. Hello Cathy, When I was on holiday at my friends home in New Beith near Brisbane, we went to visit a mutual friend and his wife for a couple of days in Maleny. On the morning we left Maleny we had a walk around the town and the artists shop was declared a favourite by all of us. We each bought something in the shop. My memento of my trip to Maleny was a picture of a Kookaburra and my friend Janet really loves frogs, she bought a kettle with frogs and I am sure she will be back for more. Whilst at the shop we collected business cards for most of the artists and yours has already proved to be worth collecting. It was a pleasure to see all the various items in the shop and I am sure that I will be keeping the cards for future gifts for other friends. I just wanted to send you a few photos of our wedding day, mainly so you can see how much we love your frogs, and how they were part of our wedding….from carrying the wedding rings (our grandson was the little page boy)….to decorating the table…..to serving as a ‘wishing well’ for our cards and gifts. Thank you once again for making those tealight candles for us. 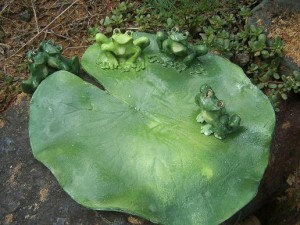 I’ve added a photo of us as you might remember meeting us…..you made the ‘twofrogs’ plaque for us a couple of Christmases ago, and we picked it up in Montville. We will continue to buy your lovely creations, as they bring a lot of joy to our home. Wow !!!! what an experience to be able to escape and create !! The weekend at Cathy’s ‘Friedmudd Studio’ was more than I could imagine…… Cathy gave my girlfriend and I undivided tuition,encouragement (as we had last held a piece of clay in our hands at high school and we were unsure of how the clay would feel second time ever! )fun and laughs.!! Cathy is a relaxed, patient, genius of a teacher ….she makes you feel capable of anything. With Cathy’s care and amazing artistic touches and suggestions we were able to create pieces of work I never thought possible ! My girlfriend made ducks,chooks, geckos on logs and frogs! My fantastic weekend was spent creating a cloche style hat on a stand as well as a cherubic statue of a naked woman wearing a hat! When my husband saw the pieces he suggested we set up our own gallery as the works were so good! Apart from the workshop taking you to another place in time …,(So engrossed were we that it felt like we had left the planet for about a week! ) Cathy provided amazing hospitality with homemade scrumptious cakes, lunch ,freshly brewed coffee, and house and garden tours. Maleny is viewed from her lovely verandah …between rolling clay coils and munching fine food and meeting a truly remarkable woman it was a weekend to REMEMBER ! I hope to return in the not too distant future. This weekend should be on everyone’s bucket list!